With the Japanese Yen collapsing around its own proverbial ears, the fate of the country rests on Mikuni and Kimimaro's final struggle for control of the Financial District. But which is better, the present or the future? There's only one way to find out.... fight!! 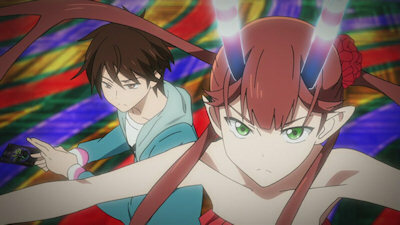 What this really brings us is a long, protracted argument between these two characters as they run around fighting for their competing philosophies - an argument which turns from the theoretical to the personal once Mikuni's sister gets involved in the discussion, a debate which even extends to the pair's Assets. While all of this is going on, confidence in the Yen hits rock bottom as most businesses refuse to use said currency, switching to use of the Dollar instead. Indeed, so huge is the drop in confidence in the Yen that it also renders Midas Money as pointless as per Taketazaki's plan, thus putting an end to the battle between Kimimaro and Mikuni as the latter accepts defeat and hands control of the Financial District's rotary press to the former. With "C"'s return having no impact on Japan thanks to the Yen's collapse, Kimimaro turns back the clock on all of the futures "borrowed" by the Financial District to return Japan to normal...or has he? With no sign of the Yen anywhere, and the future on show seemingly different from what he remembers, is this really what Kimimaro fought for? Indeed, is his struggle even over as the Financial District promises to carry on unbridled despite his efforts. I suppose there was really no other way to resolve [C]'s major plot points other than an all-out scrap between Kimimaro and Mikuni, but somehow it all felt a bit arbitrary and simply a rehashing of the arguments we'd seen building throughout the series anyhow. Still, this brought us a decent enough ending, and at least the positioning of the Financial District as a force for neither good nor evil but simply a cipher for the desires of those who use it felt like a reasonable closing position for the series to take. Overall, that leaves [C] to be labelled in my eyes as a series that was brave with its concept and subject matter (making economics interesting is a big ask no matter what you try to bolt it onto) and with plenty of fascinating concepts behind it, but also a series that didn't really seem to know how best to handle those concepts. In short, it never really felt confident in its delivery, and thus none of the points it set out to present to the viewer were realised in a forceful enough way to make you actually care about them within the context of the series and its characters. Don't get me wrong, I'm certainly glad I watched [C], and a time of protracted financial crisis it posits some important points for debate and consideration. Conversely though, perhaps that's why I was hoping for so much more from the series - with subject matter so close to the hopes and prospects of the entire populace, it feels all the more vital that it was presented in a way that gripped all and sundry within its confines, and on that count it most certainly didn't succeed.